A swollen face , serious tooth pain , a gum boil , all may point to a dead tooth. 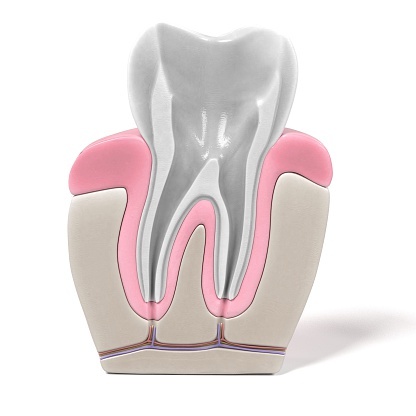 There is a solution, a root canal, and they can be done gently. What is a "dead tooth" you ask . The core or centre of a tooth is living tissue very much like skin. A blow to a tooth ( more common with front teeth),or a large cavity, can damage the pulp or core of the tooth resulting in death to the pulp. As the pulp cannot swell up like your skin can , pressure builds up resulting in pain to temperature, to touch, or to just nothing at all. The worst part of a root canal is your tooth telling you that you need one. When the warning signs appear, don't wait, call your dentist immediately. Warning signs may be; tenderness to pressure on the tooth, swelling around the tooth, tooth pain that starts to linger longer and longer, and finally a raging toothache. X rays may reveal a silently dead tooth , generally by the bone damage the low grade infection causes around the tip of the root. Watch below to see how this problem is treated.